With conference season upon us, quite a few authors will be tearing their hair out while they try to perfect their pitches. In an attempt to protect hair follicles everywhere, I’ve compiled a few tips on how to prepare for pitching your manuscript to a prospective editor or agent. 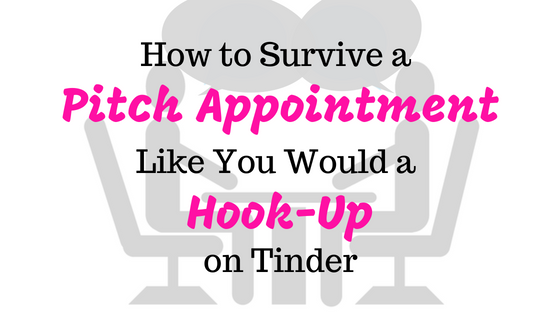 Much like surviving a hook-up on Tinder, a pitch appointment can start off rather awkward but end up being a mutually rewarding, long-lasting relationship if there’s a match! You may want to deck yourself out in a pencil skirt with stiletto heels, but if you’ve got bunions and haven’t worn anything but flip flops in the past twelve months, you might risk falling flat on your face. Protect yourself from an embarrassing snafu by making sure you dress in something that makes you feel confident, capable and comfortable. You’ll do a much better job of selling yourself if you’re not worried about a wardrobe malfunction. Trust me on this one, okay? Your writing buddies have told you to do it. Your mentor has mentioned it a bazillion times. The old saying still rings true… “Practice makes perfect.” Or at least when it comes to pitching, practicing your pitch ahead of time makes you more likely to actually say something about your manuscript when you sit down. You know, as opposed to saying something about a prospective agent’s shoes. Or an editor’s change of hair color. Not that I would know anything about either one of those embarrassing scenarios. If you’ve made it this far, congratulations! Not only did you survive my tips but you’re also now better prepared for your pitch appointment. I’ll be keeping my digits crossed for you… that your pitches are successful, that you keep your bodily fluids to yourself, and that you receive the enthusiastic YES! YES! YES! that you deserve and crave. Are you pitching to an agent or editor at an upcoming conference? Previous postAll-American Cowboy is Ready for Reviews! Next postThe Countdown to All-American Cowboy Begins!